Yeah, I know Open Source Everything is too radical for the masses and will never manifest in my lifetime but I feel its rumblings. 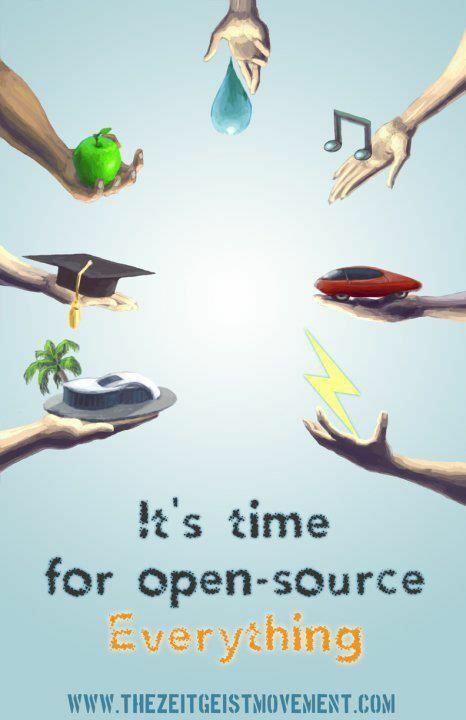 I can imagine that some day we will open source food, water, shelter, electricity, transportation, education, art, music. Love. More than feeling, I’ve been riding the rumblings ever since I ran away to join the punk rock circus. Busy playing music, we didn’t talk politics all the time but knew we were teetering upon the precipice of revolution. It fueled us. Fed us. And now, is a quantum leap or perhaps even a new paradigm upon us at last? Did our caterwauling lead to anything? As we lament the glacial pace of change, it seems we can’t keep up as it pertains to media. The subject of vinyl arose this past week. People’s feelings about vinyl reveal their feelings about change. Adapt or die, right? But, resourceful to the bone, we find ways to make the old new again. I kept my turntable but moved around so much it was impossible to hold onto all my records. I still mourn the loss of some LPs like deceased friends. Apparently, there is a resurgence in vinyl. Check out the Vinyl Engine. Our friends, the scintillating Petunia & the Vipers just released an album and I hear that young people are only interested in vinyl these days. They may acquire mp3s but when it comes to buying, crave cover album artwork and liner notes. Just like we did! And then there’s video, which has evolved to the point of digital. I don’t regret the demise of tape, revel in the mobility of the camera, to the point of one-in-every-cell phone, hence the rise of citizen journalism, Arab Springs, etc. Canucks won their do or die match against Chicago! I don’t understand why they can’t play that well consistently. I suppose beating the Hawks in two more games is within the realm of possibility but seems unlikely. Funny, I try to ignore hockey but you know you’ve got it bad when you find yourself actually reading the Sports section. I always manage to get caught up in the excitement, recently and entirely sucked into Team Canada-Olympics games. I can’t help it; it’s in my DNA according to my long gone mother Corona Beliveau, second cousin to the great and beloved Montreal Canadian Jean Beliveau, still going strong, last I heard. They do share the same thick, dark hair and good looks but I took everything Ma said with a grain of salt. She was also Irish, a real queen of blarney and consummate storyteller. I’m convinced it’s one of the reasons I am a poet. She also said my grandmother Genora Beliveau, would throw empty mickey bottles at the opposing team’s players, ejected from more than a few games. Grandma was quite the spitfire, sadly dying of cancer when I was just a toddler. On that note, Happy Mother’s Day! My boys took me out to dinner, a nice break from the routine. I did go out Saturday night though, to W2 and Jamie Reid’s book launch for Prez, his Lester Young book, Prez being Billy Holiday’s nickname for the legendary saxophonist. Kim Goldberg opened with a performance of poetry from her book Red Zone, shining an unerring spotlight on Nanaimo’s homelessness and urban decay. Pete (Trower) read some of his musical jazz poems and Jamie read from his lyrical homage, backed sublimely by Craig McCaul on guitar, Niko Friesen and Jen Hodge on bass. I met fellow ROCKsalter George Payerle and got to visit with pals Daniela Elza, Kagan Goh, Warren Dean Fulton, Shannon Rayne, Carol Reid and Kedrick James, a superb master of ceremonies. A fabulous evening and as Jamie said, “Dancing until the dust rose in clouds from the floor, / they put sweet rhythms into Lester’s horn.” Pete remarked he was happy to see young people playing jazz. It’s not going away. Jazz will always have its aficionados, just like punk rock, the Vancouver breed immortalized in Susanne Tabata’s Bloodied But Unbowed, premiering at DOXA Documentary Film Festival this Thursday. I’m sure to run into some of my punk rock homies though DOA is on the road, not surprisingly. Susanne got in touch with me at one point for an interview as I was in the 45s with Randy Rampage and Brad Kent but the meeting never happened. Story of my life, I swear! Surely I’m not the only one. Reportedly there are over 100 hours of out-takes. Oh well, it’s a . . .